Tensions are rising as we edge closer and closer to President Trump announcing his nomination for Justice Kennedy’s Supreme Court seat. This past Friday a conservative radio host walked off the set of an HLN segment on Friday when one of the contributors from CNN made a rather shocking and offensive comparison between Christianity and Sharia law. Dean Odeidallah, a CNN contributor, made a comparison between Christian biblical law and Sharia law that caused Steve Deace to walk off the set. 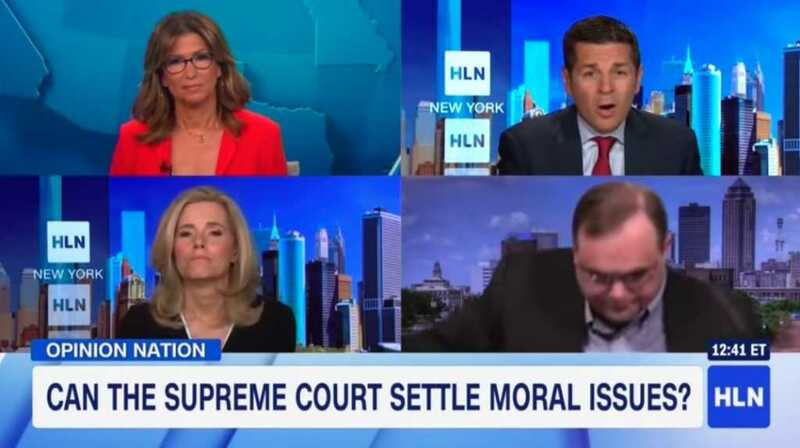 The guests were on the HLN segment to discuss the upcoming nomination of a new Supreme Court justice by President Trump, and the implications a new justice would have on the system. But Obeidallah took the argument off course and into offensive territory. Deace, after waiting and listening to the others for about three solid minutes, finally get’s a chance to talk. He fires back at Obeidallah, saying that there is no comparison between Islamic Sharia law and Christian beliefs in the United States. Deace chimes in again saying that he was brought on the show to be the punching bag, that the other three lay into the entire time. He points out that he started the discussion with the purpose of having a civil discussion that might make progress with the differing views, but that it didn’t matter because “Nothing get’s accomplished,” on the show. He points out that what Odeidallah says is simply what his fans on Sirius XM want to hear, and that there is no effort to bridge the gap, but merely to appeal to his listeners. As Odeiadallah continued to go off about how Christians are trying to implement Biblical law in the United States, Deace took out his earpieces and left. To note, Sharia law is the religious Islamic law that causes leaders to push LGBT people off of buildings in the Middle East, or advocate for the death penalty for those that are gay.